Gemini May 2016 Horoscope warns that they should complete projects on hand before the 21st or the end of the Mercury retrograde. After that emotional and domestic aspects will become stronger and your actions will be governed by feeling good rather than being ambitious to complete your projects. Your career path should be regulated to the needs of family and emotional stability. In May 2016, the Gemini personality should be aggressive in their actions and follow their course relentlessly. Challenges should be handled deftly and diplomatically. You will be able to accomplish really big plans with your enterprise. There will be change of jobs for the Gemini in May 2016 due to the influence of the lunar eclipse. The atmosphere at the organization where you are employed will be different. Business will see change of plans and structuring. The May 2016 astrology forecasts for Gemini predict that your financial plans are affected by both Mars and Saturn during the month. Mars will force you to speculate and be bold while Saturn will give you the necessary balance in your actions. You should go by your personal discretion whether to be cautious or aggressive depending on the merits of the project. Your financial position will flourish during the month due to your own efforts as well as the assistance of your friends and social circle. The lunar eclipse of the 4th May will induce major changes in the financial plans of the Gemini zodiac sign. Your investment strategies will undergo important transformations. The Gemini May 2016 horoscope predicts that singles will find romantic opportunities while they are chasing their professional or health goals. You may also find your soul mate in an academic environment. Gemini in committed relationships look for personal freedom and this may lead to conflicts. A fair appraisal of the partnership will be in order before you plan for a child. You should be guided by your feeling of happiness in these matters. You will have to be more tolerant towards elder members of the family during those days. 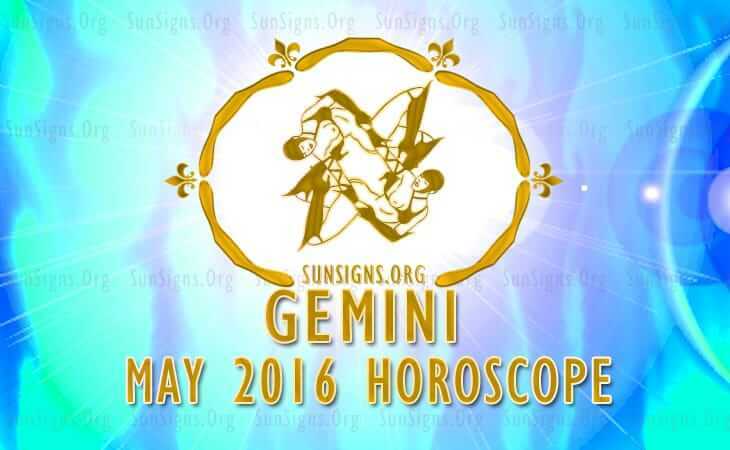 Health of Gemini will be outstanding during May 2016. Fitness and diet plans will need more modifications. Take a look at the health benefits of a few everyday foods. To conclude, the May 2016 Gemini monthly predictions, foretell of a month where you need to improve relations with family as well as take care of your finances.